This exciting project (headed by Mick Garris) follows the template of horror-slanted TV shows like Tales From The Dark Side, Tales From The Crypt, and the more recent Masters Of Horror which also employed known genre directors to bring to life a variety of creepy, dark and scary stories. 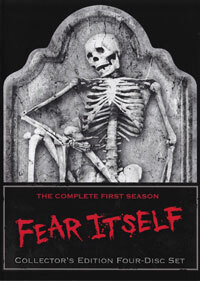 The 13 tales of this first season cover a wide range of genre themes, from ghosts, vampires, zombies and werewolves, to voodoo, cannibals and serial killers. The directors include John Landis (An American Werewolf In London), Darren Lynn Bousman (Saw II - IV), Stuart Gordon (Re-Animator), Ronny Yu (Freddy vs Jason) etc. Garris is no stranger to these themes as he'd been a Stephen King veteran with mini-series like The Stand and The Shining, and put together a very cool batch of TV shows, which doesn't feel like TV shows at all, but short films. Fans of System Of A Down vocalist Serj Tankian will be glad to know one of his solo songs is the show's theme tune. This 4 disc box set of the first season unfortunately includes no extra features.